You know, I love poetry games. The idea of making poems up on the spot based on words randomly assigned makes me happy. Writing group poems with 1st through 6th graders, never knowing what they’ll come up with, makes me happy. 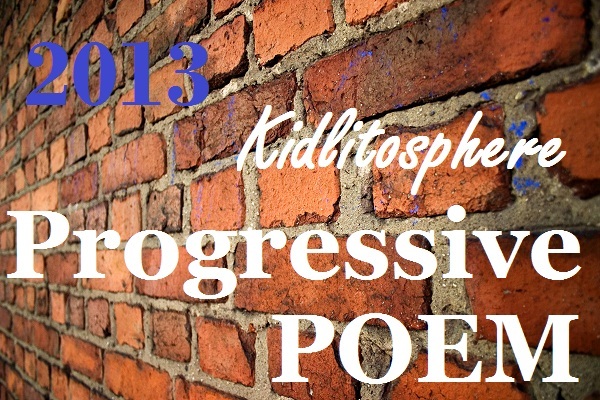 Adding a line to the 2013 Progressive Poem makes me…well, happy, actually. Though with more stress in the equation than those other two situations. What made it stressful for me? I love short poems. So a poem that already has 27 lines before it gets to me is unlike most poems I read! I was getting impatient to wrap this baby up. So many wonderful poets/people have already participated, and I didn’t want to mess up what they have already done. I wanted to not only write the next line, but the whole ending. Each line wiggling through my head made me think, “Oooh, that would be great if the line after it did ______________.” Fill in the blank with whatever pressure/burden I decided to put on the penultimate poet, Denise Mortensen. Luckily, I love the tension Ruth Hersey of There’s No Such Thing as a God-Forsaken Town added in her line. What a wonderful springboard to get to jump off of. And even though this is intimidating, really, it’s a lot easier than taking part in a progressive dinner or something, and having loads of people come to your house to eat food?and inspect your taste–or lack thereof (oh, wait–that will be my daughter’s graduation party in a few weeks–ack!). Anyway, here is our Progressive Poem so far! Swinging upside down, throw and catch new sounds? dangle high, blood rush; spiral down, crowd hush? if your meter takes a beating; your rhyme runs out of steam? Finger by finger you’re reeling them in? Check out my right sidebar, and make sure you visit the last two days of the Progressive Poem. Thank you, Irene Latham, for organizing a bunch of clowns, word jugglers, and wild writers into the barely contained madness of a progressive poem! I can’t wait to see the grand finale! Thanks, Catherine–Can’t wait to see the ending! What a cool set-up, Laura, and such fun to read! Thank you for your generous poem starter videos this month. I have been talking them up. :). Happy quieter May. xo, a.
I love it, Laura. When in doubt, release the lions. 🙂 And the internal rhymes are so powerful in your line. I’m excited to see where this goes. It looks like we might finish with a roar! Thanks, Carrie–I’m eager to see the big finish, too! Inky paws! I LOVE it! Watch out, folks, the Poem is uncaged! Your words have caught every bit of the circus, Laura. I can smell the popcorn, and the excitement! Wonderful! Oh my!!! You never fail to amaze me. I just love, love, love that line! I can just see the inky paws and sawdust! Mission accomplished, Laura! Love this. All that internal rhyme… and yes so near the end now. THANK YOU! Thanks, Robyn! It was fun to write, too! I love how you brought some danger back into the poem, Laura. Love those “inky paws”! Can’t wait to see how this whole poem wraps up. Thank you! And I’m off to check out your new link! Great internal rhyme, Laura, and a fun, vivid image! Denise & April have their work cut out for them! I LOVE your line, big cats and poetry… I can see and smell this line! Wow, what an image! A hint of menace in our poem, no doubt ready to wow the crowd with beauty. Completely unexpected – love it! Whoa Nelly! I’m running around catching up and here’s a surprise! I thought we were going to HEAR the poem nearing, but now we SEE it creeping up on us…will it eat us alive or what?